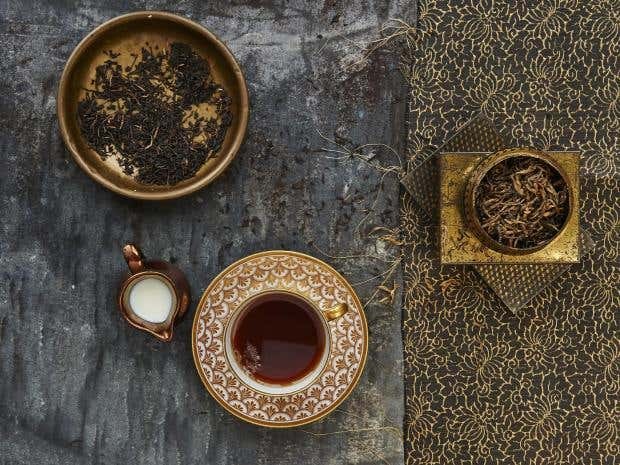 Tea can be a lifesaver in winter, but if you suffer from caffeine intolerance, or simply aren’t a fan of good old English, why not let herbs, dried fruits, roots and spices come to your rescue instead? Tisanes are made by infusing plant material in hot or boiling water. 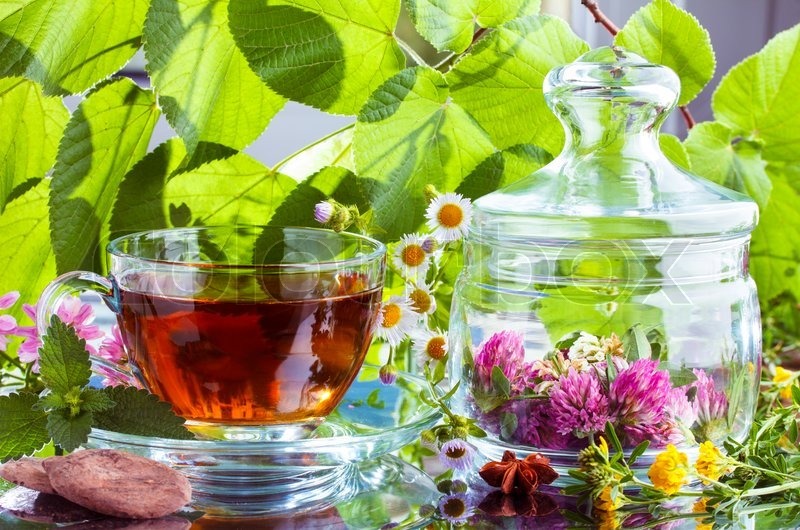 Though commonly called herbal teas, they are not, in fact, teas at all: “proper” tea – from black and green to yellow and oolong – comes from the cured leaves of the tea plant. Tea is the second most widely consumed drink in the world after water, so there are seemingly endless brands to choose from. Finding the most delicious tisanes involved sampling a range of mostly new flavours from a mix of established and just-launched tea makers, testing for strength, aroma, taste, value for money and of course, how warm and cosy they left us feeling. Keen to keep your teapot busy until it’s time to crack open the Pimm’s again? Look no further than our pick of the best herbal teas, all caffeine-free and available to buy online. 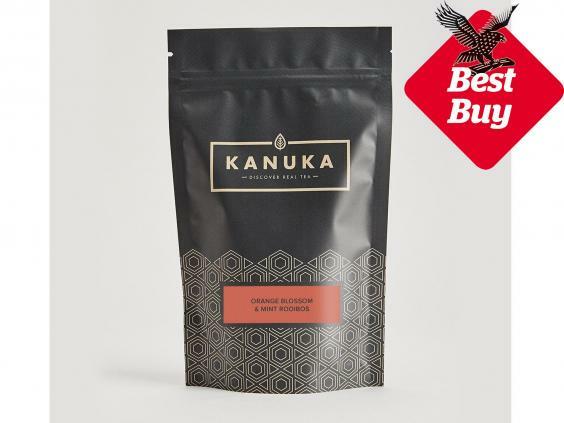 If it’s real depth of aroma you are after, this gorgeous loose leaf blend from new tea emporium Kanuka will blow you away. The classic citrus flavours of orange and grapefruit are mingled with a mild hint of spearmint for a wonderfully fresh edge, while its base comes from the leaves of the calcium-rich rooibos plant, grown under the South African sun and known for helping to ease hypertension. Heap two teaspoons into 250ml of nearly boiling water and allow it to infuse for four minutes before straining. Opening the easily resealable pouch is a sensory delight, with the added joy of finding whole chunks of fragrant orange in the mix. Kanuka has a tea house in St Albans as well as an online store, so dig and delve for original gift ideas. 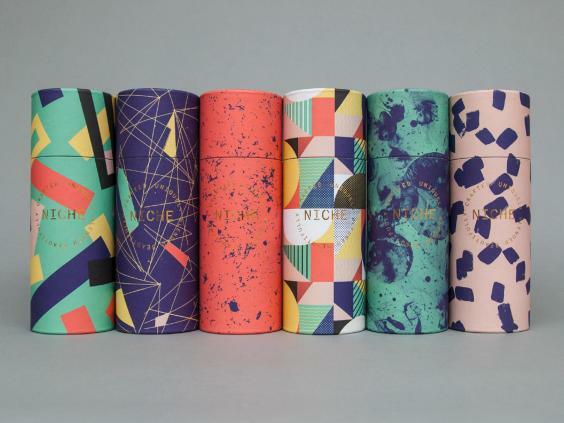 Brand spanking new British artisan brand Niche has just launched its first collection of teas, designed to aid health and wellbeing for your mind and body with a formula of medicinal natural herbs. The brains behind these delicious, all-natural blends have spent years researching the best teas for energy, digestion, skin and more. “Sleep” is our favourite, made with soothing chamomile, calming lemon balm, passionflower and lavender on a rooibos base for a restful night’s kip. It can be drunk with milk for extra soporific effect or after steeping in water for three minutes. The oh-so modern recyclable packaging deserves a special mention – these are our favourite on the list for gifting, and sit pretty in your kitchen. Missing summer? Us too, which is why we loved this floral delight from established North Yorkshire family business Taylors of Harrogate. Hibiscus, rosehip and apple pieces are blended with sweet blackberry leaves, lemongrass and organic rose petals for a flavour fit for afternoon tea at Buckingham Palace. This infusion has been created in partnership with Kew Royal Botanic Gardens, who know what they’re talking about when it comes to the finest all-natural fruits and herbs. 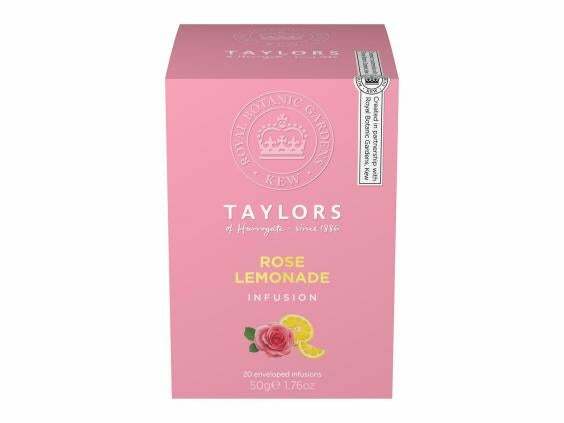 Fragrant notes of an English summer garden hit first, followed by a beautifully complementary, zesty burst of lemon, with a four-minute brewing time turning the water a deep magenta colour. Tea bags come individually packaged in baby pink sachets and can be used multiple times without losing their potency. These are ideal for cleansing the palette after a spicy meal and are also refreshing once cooled. 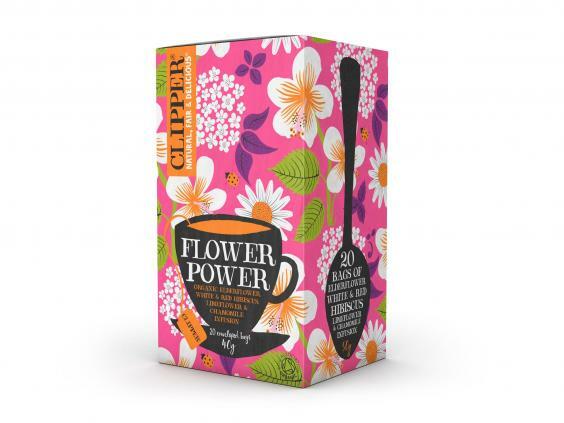 Dorset-based Clipper wins the fun packaging prize with its colourful flowers, leaves and ladybirds, but it deserves kudos for its ethics too. The UK’s first Fairtrade tea company uses organically grown ingredients with nothing artificial added. If you notice that the tea bags are a funny colour, it’s because they are unbleached, while the box is biodegradable and recyclable. Luckily, it tastes yummy too, with delicate elderflower, hibiscus and lime flower taking drinkers back to sunnier days. The Infusions range launched this year, with other flavours including Skinni Mintie (double mint and caramel) and Calmer Chameleon (chamomile, honeybush and cinnamon). Pour over freshly boiled water and leave to steep for at least three minutes to enjoy the fruity floral flavour at its fullest. It’s alright, we raised our eyebrows too, but bear with us. 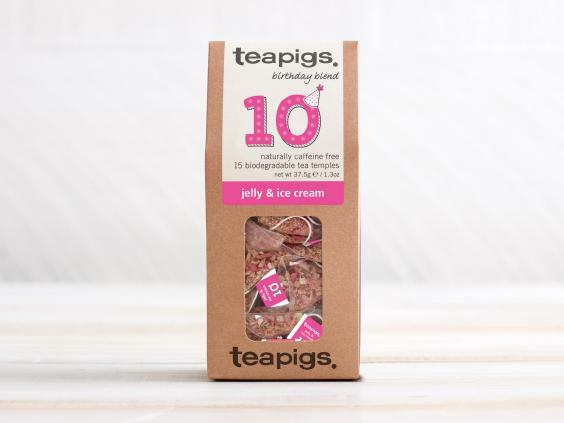 This exciting, nostalgic blend is a limited-edition release to celebrate 10 years of British brand Teapigs, and it really is a birthday party in a mug. If the flavours sound too wacky, knowing they are all natural may tempt you to give this one a go. Full pieces of apple, blueberry and strawberry mix with natural raspberry, vanilla, cream and biscuit flavourings for a scrumptious adult twist on a favourite children’s dessert. Biodegradable tea “temples” give the flavours plenty of room to infuse, resulting in a sweetly addictive yet nutritious beverage that also tastes great iced. 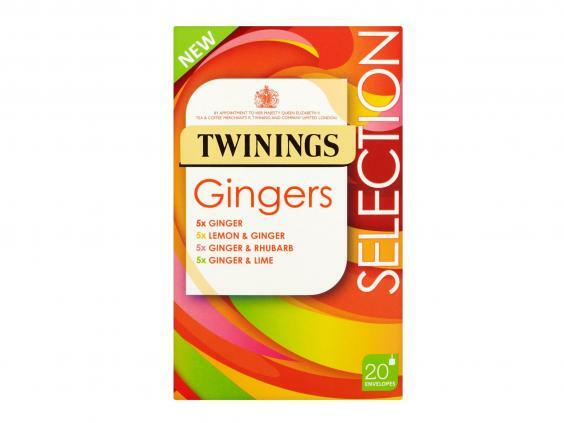 Few spices can warm you up after a chilly winter’s walk like ginger can and if it’s your favourite flavour, your cupboard is calling for this new selection pack from quintessentially British brand Twinings. Choose from fiery ginger, flu-busting lemon and ginger, zingy lime and ginger and snuggly ginger and rhubarb, with each bag enveloped for freshness. Try adding a spoonful of honey to help ease a sore throat or using two bags to pack an even stronger punch. It’s worth noting that, bar the lemon and ginger, these tisanes contain a heavy hint of that most Marmite of all roots: liquorice. If it’s not your thing, try the mints, fruits and chamomile selections instead. 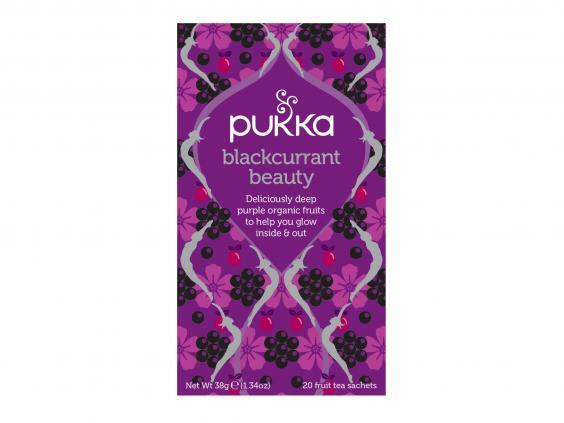 If you want something with all the fruity joy of hot Ribena, but a touch more class, try Pukka’s recently released, 100 per cent organic stunner. Jam-packed full of juicy blackcurrants and sweet beetroot, it’s a great tonic for the skin, containing special antioxidants that boost circulation. Each teabag is individually wrapped to protect its high essential oil content from light and moisture and keep its health benefits intact. Liquorice and fennel are instantly dominant, but infuse for at least five minutes to let the subtler tones of hibiscus, rosehip and orange peel soak through before taking your first sip of this rich tisane. Made in the UK, Pukka’s attractive packaging designs are printed with vegetable ink onto recyclable card, while the bags are staple-free and wildlife friendly to compost. Time for a conscience-free cuppa. If loose leaf tea is your bag and you prefer to stick to the classic flavours, Good & Proper tea should be a staple in your pantry. Each one is made from carefully sourced and curated herbs, all grown in the same country, with the peppermint blend originating from Egypt. 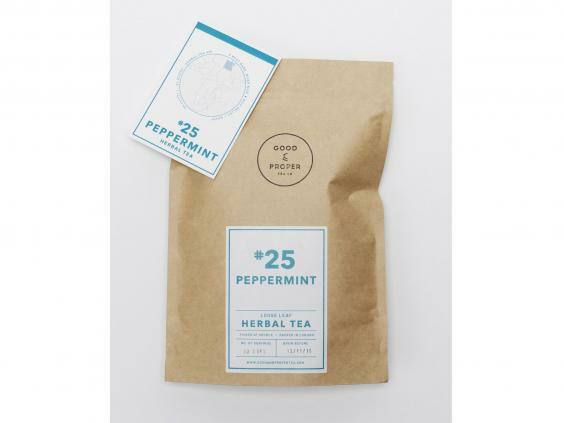 Unlike some dusty teas, the large dried peppermint leaves are kept whole for maximum flavour and help aid digestion after a rich and heavy meal. Nothing is added, with everything in the pouch as it was when it was picked at source. If you can’t settle on a blend, the new herbal tea collection lets you sample five and comes with a cute glass teapot. Get yours either online or at the flagship Tea Bar on London’s Leather Lane. For the warming, nostalgic taste of fresh-out-the-oven apple pie in a mug, try this blissful blend of apple and cinnamon. This new range of fruit and herbal infusions from one of Britain’s favourite tea companies is totally caffeine-free and with less than five calories in each teabag, you can silence your sugar cravings guilt-free. 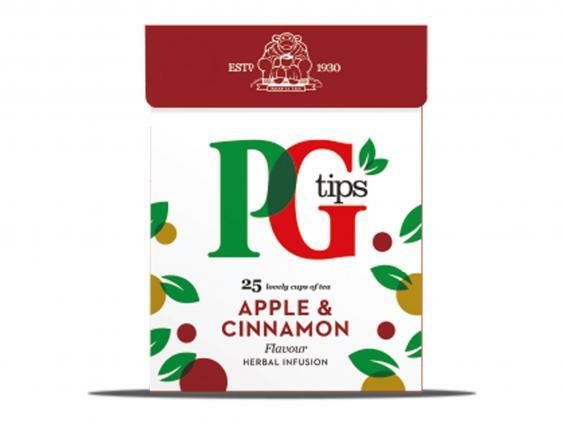 PG Tips’ famous pyramid bags allow the leaves to move when brewing for a fuller infusion that packs each sip with the strongest, most irresistibly scented flavour on this list. If your sweet tooth refuses to be satisfied, try the pear and caramel. Tea doesn’t come much more “hygge” than this. 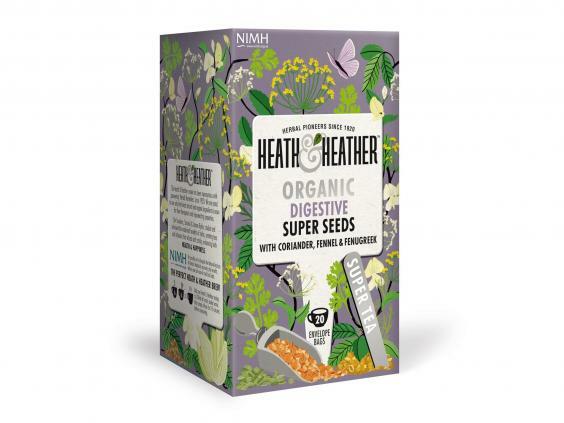 High-quality herbal pioneer Heath & Heather has been busy converting its entire range to organic, yet has still found time to launch a new five-strong collection of Super Teas. Brothers Samuel and James Ryder were among the first to study the medicinal qualities of English herbs, and founded the company in 1920. This 100 per cent natural fennel and fenugreek blend for healthy digestion comes recommended for those who enjoy peppermint and its benefits, but are keen to try something different. Try the Detoxing Slim Tea for natural weight loss and the Energising Morning Time for a wake-up boost. More than 500 varieties of plant material are used in the landscaping of the Central Garden. The Getty Center features several gardens and fountains, and landscaping for public enjoyment, including a cactus garden at the South Promontory, fountains in the Museum Courtyard and the Tram Arrival Plaza, shaded hideaways, and spectacular views of the Santa Monica Mountains, the Pacific Ocean, and Los Angeles. 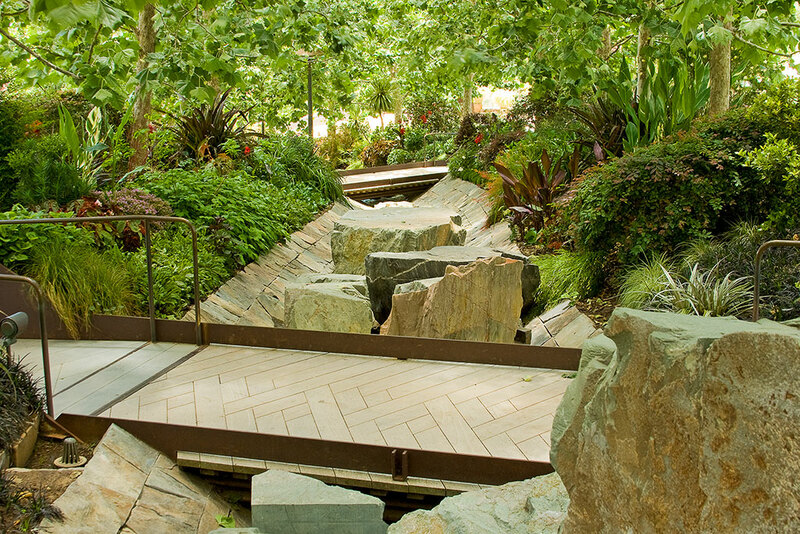 The Central Garden, created by artist Robert Irwin, lies at the heart of the Getty Center. 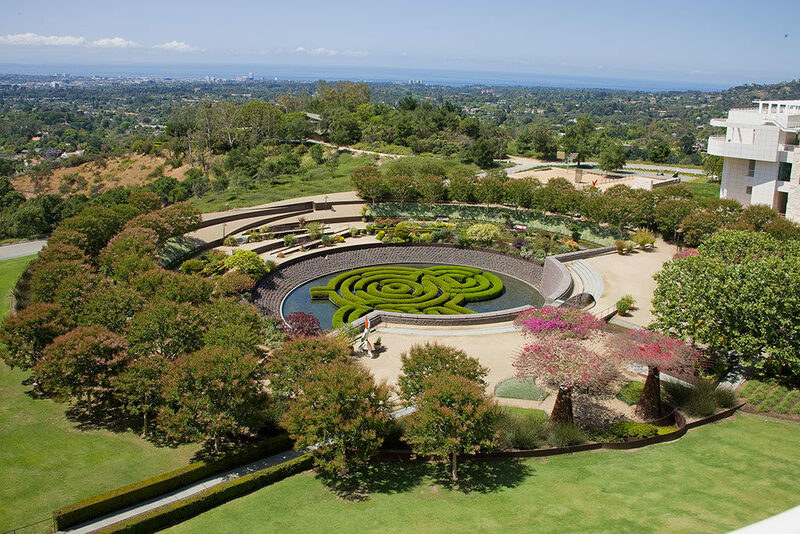 The Central Garden, created by artist Robert Irwin, lies at the heart of the Getty Center. The 134,000-square-foot design features a natural ravine and tree-lined walkway that leads the visitor through an extraordinary experience of sights, sounds, and scents. The walkway traverses a stream that winds through a variety of plants and gradually descends to a plaza where bougainvilleaarbors provide scale and a sense of intimacy. Continuing through the plaza, the stream cascades over a stone waterfall or “chadar,” into a pool with a floating maze of azaleas. 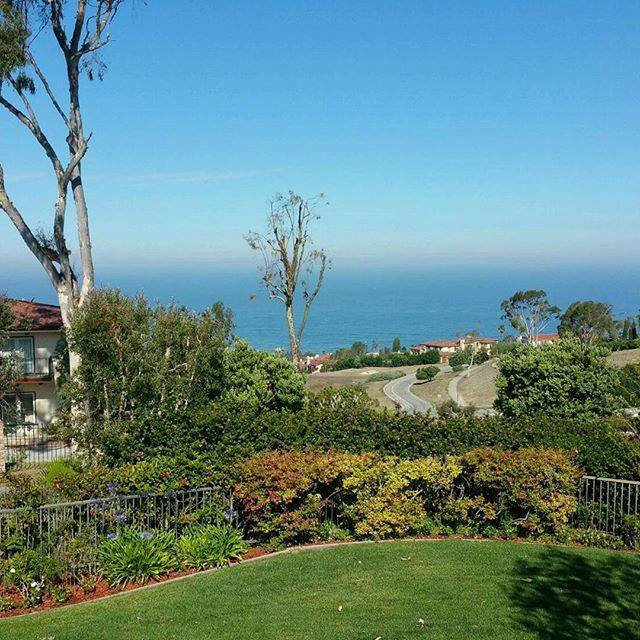 Specialty gardens encircle the pool. All of the foliage and materials of the garden have been selected to accentuate the interplay of light, color, and reflection. The natural ravine and tree-lined walkway that leads the visitor to a central clearing. Irwin began planning the Central Garden in 1992, as a key part of the Getty Center project. Since the Center opened in 1997, the Central Garden has evolved as its plants have grown and been trimmed. New plants are constantly being added to the palette. Irwin’s statement “Always changing, never twice the same” is carved into the plaza floor, reminding visitors of the ever-changing nature of this living work of art. 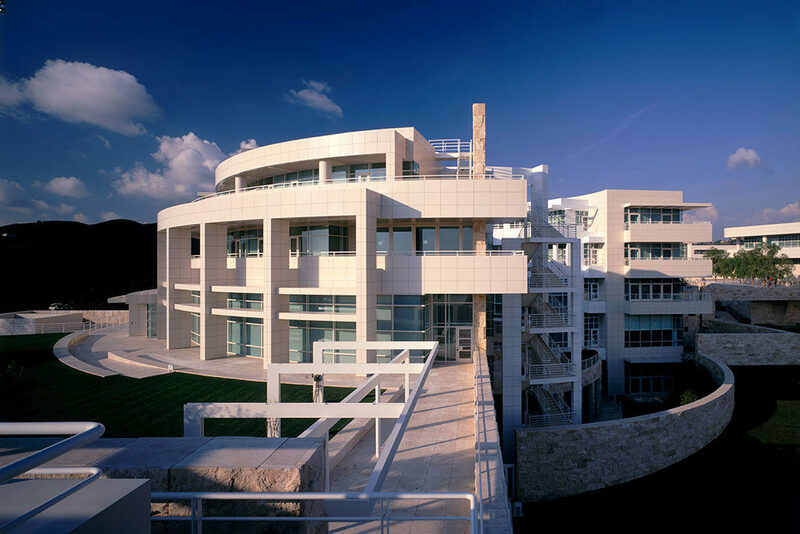 This 45-minute site tour explores the legacy of the Getty Center’s groundbreaking architecture from concept to construction to its opening in 1997. Meet outside the Museum entrance on the bench at the top of the stairs. The Getty Villa is currently being reimagined.Please excuse some temporary gallery closures and restricted access to the Outer Peristyle during your visit. See the most current information to enjoy our many open galleries and special program. Getty Center has free admission but parking is chargeable. $15 flat rate is the parking fee. The same is $10 if you enter after 3pm. 당신의 집의 가치를 몇분만에 알아 보실수 있습니다. 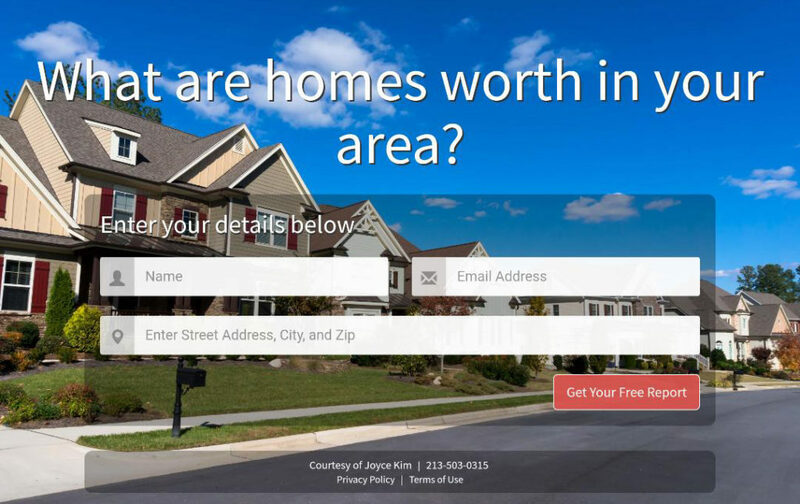 Enter Your Address Below. It will only take few minutes. 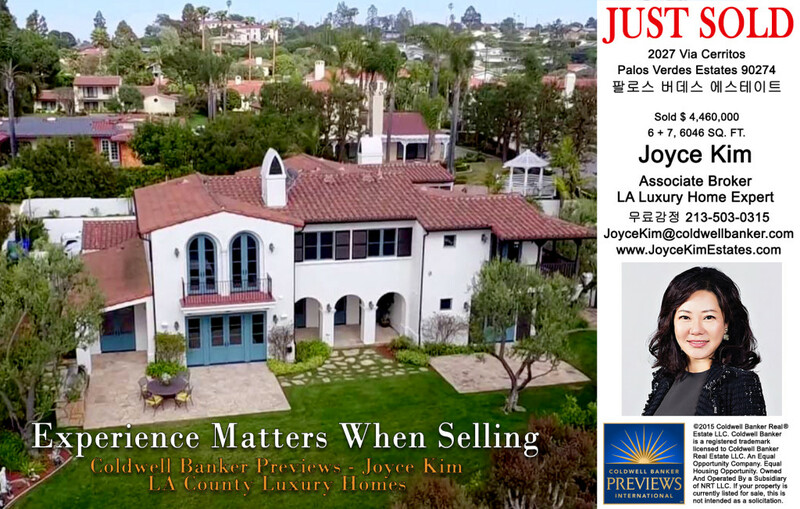 Email – Joyce Kim for FREE Seller Package Now! 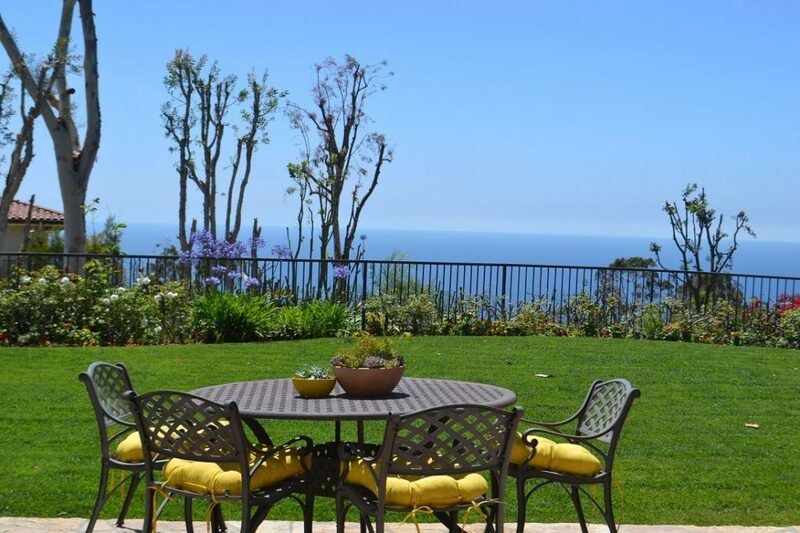 8 Practical Facts & Tips To Get Your Home Sell With Best Price! 셀러가 가장 집을 높게 팔수있는 8가지 실속있는 팁스를 담은 – 브클렛을 – 무료증정 합니다.